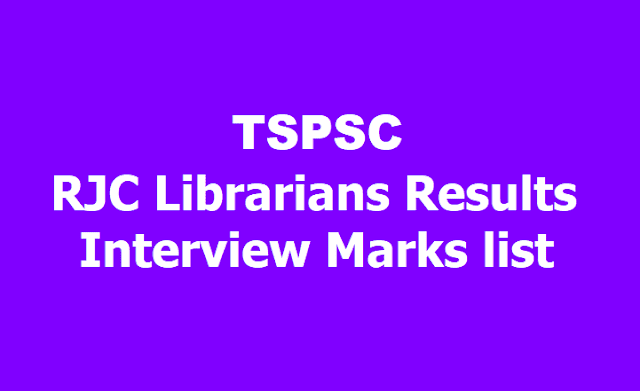 It is hereby notified that on the basis of the results of the Main Examination held on 12/05/2018 FN and Oral Test (Interview) held on 19/12/2018 & 20/12/2018 at TSPSC Office, Hyderabad, 38 candidates with the following Hall Ticket Numbers have been selected against 42 vacancies for appointment to the post of Librarian(Junior Colleges) in MJPTBCWREIS and TTWREIS vide Commission’s Notification No.28/2017, Dt:02/06/2017, the selections have been verified and published here-with subject to the following conditions. If it comes to the notice of the Commission at a later date that any candidate furnished false information or the selection is not in order due to any act of omission or commission of any candidate , then his/her provisional selection is liable to be cancelled at any stage and he/she will forfeit all consequential benefits including that of selection, besides that the Commission reserves the right to take any action as it deems fit in the circumstances of the case, in terms of the various provisions as notified in the Notification No. 28/2017. The candidates who have been picked up for certificate verification for the post of Librarian in Junior Colleges (28/2017) in various Residential Educational Institutions Societies are hereby directed to attend for Certificate Verification according to the time slot given below from 04/09/2018 to 05/09/2018 at Sanketika Vidya Bhavan, Masab Tank, Hyderabad. 1 Librarian (Junior College) in Telangana Tribal Welfare Residential Educational Institution Society. A Bachelor’s degree in Arts, Science or Commerce from a University recognized by the UGC. AND A Post Graduate Degree in Library Science with First or Second Class with not less than 50% of Marks from a University recognized by the UGC or an equivalent qualification. In case of SC / ST /BC / Differently abled candidates, the minimum marks shall be 45%. The Main Examination (Objective Type) is likely to be held on..... The Commission reserves the right to conduct the Examination either COMPUTER BASED RECRUITMENT TEST (CBRT) or OFFLINE OMR based Examination of objective type. The candidates who applied for the posts of Degree College Lecturers (Notfn. No.22/2017),Physical Director in Degree Colleges (Notfn. No 23/2017), Librarian in Degree Colleges (Notfn. No 24/2017), Principals in Junior Colleges (Notfn. No 25/2017), Physical Director in Junior Colleges (Notfn. No 26/2017), Junior Lecturers (Notfn. No 27/2017), Librarian in Junior Colleges (Notfn. No 28/2017) and Principal Schools (Notfn.No 29/2017) are hereby informed that, the Preliminary Examination (Screening Test) isrescheduled toDt:30/07/2017due to Bonalu festival in Hyderabad.